The weather did break. Let’s get this year started with some fish. It was a very changeable week, which produced loads of Codling whenever the weather broke. But it quickly quietened down as soon as the weather was settled for more than 24 hours. Those lucky enough to get on the beach as soon as it was possible to do so, had a bumper time, with loads of Codling. 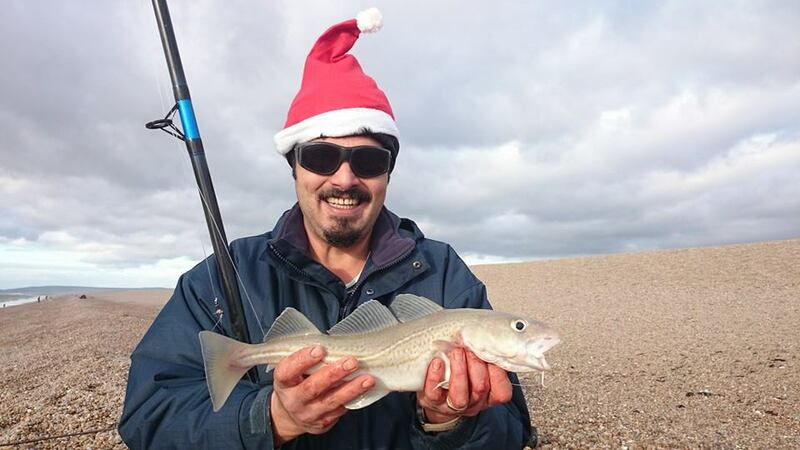 I took my mate out on Christmas eve and he managed to get his first Codling, which was less then 40yds out. I managed to get a few myself, including the largest one I have had so far this year, but as a rule most of them are still around 2 to 3lb. A lot of people have been asking me where is the best place to fish for Codling, what’s the best bait to use, and how for to cast out. At the moment when the conditions are right, you can basically pick anywhere along Chesil to fish. The end nearer Portland has produced more fish, but heading West towards Abbotsbury and West Bexington seems to be better for the larger fish. Having said that, we really have not seen many fish over 5lb at all the year. You don’t have to be able to hit the horizon on a cast, but you really do need to be hitting around 70yds with bait, to be in with a chance of connecting with the fish. A lot of people think that it is easy to hit 70yds with a bait, which if you are using a single worm clipped down, then maybe it is. But for Cod you really need bigger baits to attract them in, and the bigger the bait the harder it is to cast. My favourite bait is Peeler Crab, but that has been very difficult to get hold of recently. I have been using Frozen Hermit and Cuttlefish, along with the age old favourites of blow and black Lugworm. If someone had said to me back in September, that I would have caught 30 Codling by now I would have been delighted, and thought that I would have had a very good winter. I am now just two fish away from catching 300, and the last two seem to be the hardest to catch. They have been evading me for the last few sessions that I have gone out. I have one last chance on New Years Eve, to try and hit the 300 mark, which to me seems like I am living in a dream. I will update my progress on Facebook and hopefully be able to report back in the New Year with a picture of the 300th. Talking of the New Year, we are working our socks off (well Adrian is) to launch our new look website on New Years day. I hope you will come and have a look at it, as it will be highlighting loads of new features, that we are going to have next year. Chesil Beach forecast: With the water calm and settled until New Years day, it looks like Whiting will be the main species on the beach. I will be trying for a Codling on Wednesday, but my chances look a bit slim, especially as the water is almost clear and the tides are small. There seems to be quite a lot of Conger around, and a fair few Pollock up to 3lb. Portland: Now is a great time to pick up one of the big winter Wrasse from around the Island. Some of the Eastern marks seem to have produced some nice Wrasse this year. The Pollock are around, and should be easy enough to pick up on a lure. Weymouth Bay: Weymouth harbour was host to the Weymouth Angling Society’s increasingly popular Bangers and Bean’s competition. This year was one of the best, with loads of fish being caught. These included Eels, Whiting, Herring, Pollock and a 3lb 1oz. Flounder.